A temporary church was started in 1860 and opened a year later, designed by G Voysey and built of brick, faced with stucco (B 18 p628). J L Pearson built a permanent one for the Rev E F Newton in 1884 (ICBS). 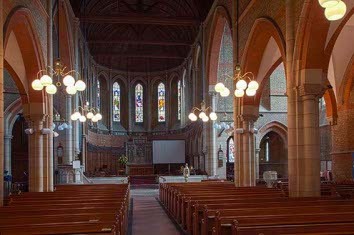 Newton chose Pearson after seeing his St Barnabas, Hove (Quiney p255) and there are many similarities. Although St Matthew cost £11,000 (ibid), Pearson regarded it as one of his cheap churches, as his choice of brick with stone dressings shows, and also the windows, which are mostly lancets. It is big, but lacks the originality of many of Pearson’s greatest churches. 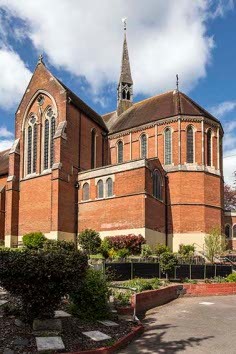 Many features are found in other churches he designed, not just St Barnabas, such as the apse with lancets that are shafted inside. However, as might be expected, it is well proportioned and planned. The ground to the east falls away sharply so the vestries are under the chancel. 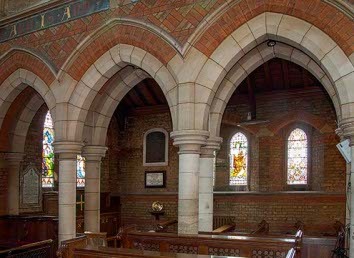 There is no chancel arch, though the short transepts have big arches east of the arcades, and nothing by way of a clerestory, except blank cinquefoils in the upper part of each bay. Nave and chancel have a handsome continuous timber roof with crownposts. The aisles have plain, groined concrete vaults, but the south chapel, separated from the chancel by a low arcade with double columns, has a wooden roof. The intended tower and spire were never built and the only vertical is a leaded flèche over the crossing. Plans on display in the church show a typical Pearson south west tower with long bell-openings and a tall stone spire. The base, built in 1895, serves as a porch (CDG 28 p52). A clergy vestry was added in 1935 and a small meeting room around 1985 (EH). 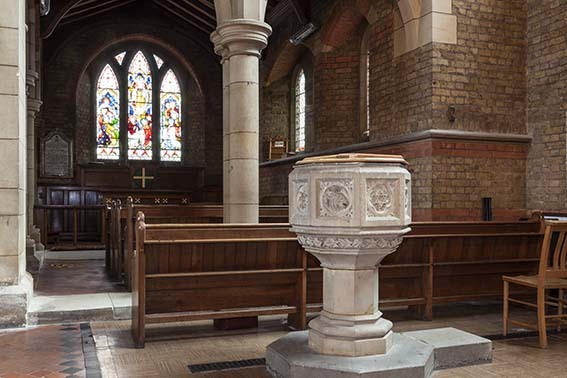 More recently the west end has been cleared of pews to make an area for social purposes and at the same time the font was moved to the south transept area. Font: Possibly designed by Pearson and installed in 1888 (C Howard and S Taylor p374). The bowl is octagonal with carving on each side. 1. (West windows, north and south) Mayer and Co, 1891 (Mrs John Cumberledge) (B 61 p247). 2. 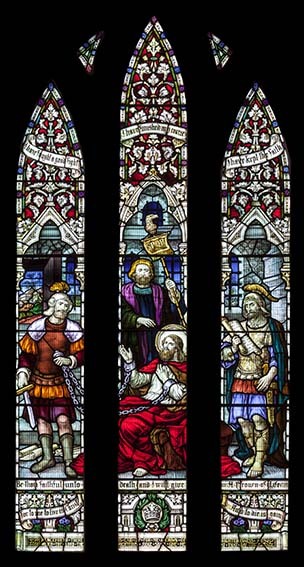 (West window) Heaton, Butler and Bayne, 1892 (Rev E F Newton) (CDG 28 ibid). 3. (South chapel, east window) Clayton and Bell (www.stainedglassrecords.org retrieved on 28/3/2013), dated 1864 and thus presumably transferred from the first church. 4. (South aisle, second window) J Underwood and Son, 1916 (WSRO Fac 3788). 5. 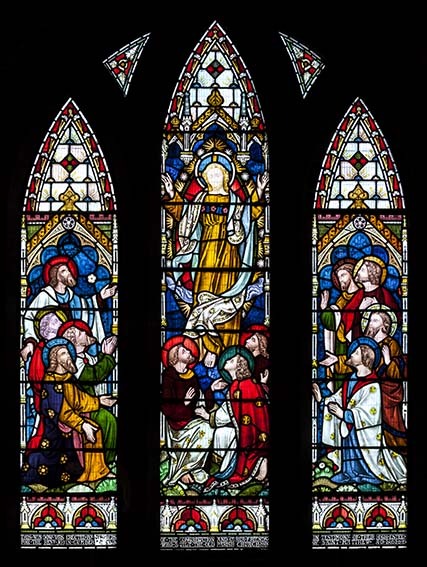 (South aisle, first window) Heaton, Butler and Bayne, 1924 (WSRO Fac 1664). Lectern: Brass eagle, supplied by T Potter and Sons of London, 1886 (BA 24 p236). 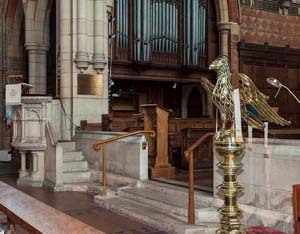 Pulpit: Stone, with blank arcading on the sides and designed by Pearson, 1888 (Quiney ibid). 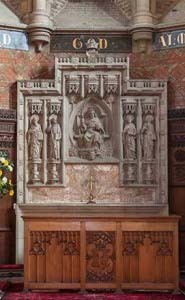 Reredos: Sir A Webb,1900 (CDG 75 p34). Stone and alabaster, with Christ in Majesty.